Leak in Surgical Safety Checklist? Since the dawn of surgery patient safety has been a major issue. In 2008 the WHO Surgical Safety Checklist was developed after extensive consultation, aiming to decrease errors and adverse effects. The WHO Checklist is used originally or based on by a majority of surgical providers around the world - even with us. Nevertheless, mistakes happen. We report a case that has taken place in our department, supplemented by literature review. Modified WHO Safety Checklist has been used in our department since a couple of years ago. Although "Team Time Out" was performed standardly following unpleasant situation happened: after an elective arthroscopy, while the surgeon finished documentation, the responsible nurse informed him that the indicator strip for sterility did not show any discoloration. No one of the operating room personal knew whether the indicator strip was not checked or if it had been overlooked although a modified WHO Surgical Safety Checklist was performed carefully. Subsequently the question arose, what does it mean to the patient if surgical instruments were not sterilized but only cleaned by Washer-Disinfector. The patient has not suffered any infection. Review of the literature has shown that the machine washer-disinfector consistently reduces microorganisms . The risk of transmission of infection may be considered negligible . 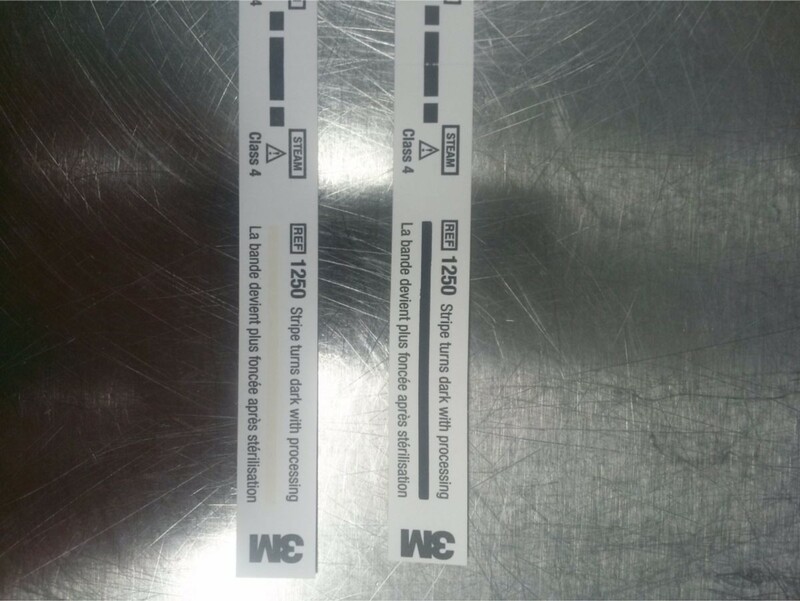 Indicator strip for sterility (black=sterility is given; white=sterility not given). Despite the use of checklists, errors still happen. Everyone on the team is required not only to do their own part. Moreover, everyone is required to take care of "the whole big picture". There are no financial interests to declare.